Le Cache refrigerated wine cabinets not only display exquisite craftsmanship, but also come equipped with CellarPro cooling systems, the most technologically-advanced on the market. 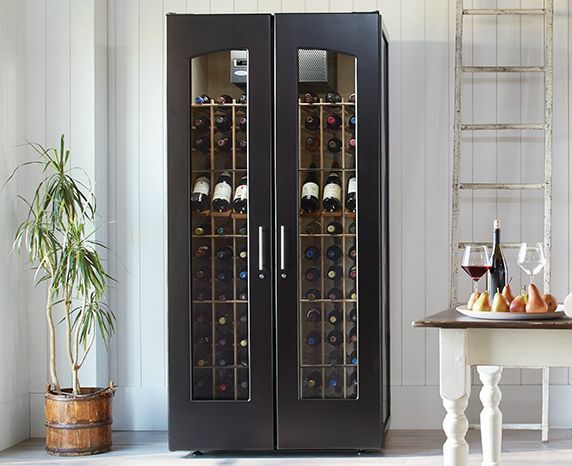 You can choose the 1800 Series model that best suits the needs of your wine collection and its environment, included in the price of your cabinet. Discover how CellarPro cooling units protect your wine and create ideal storage and aging conditions inside Le Cache cabinets. A cooling unit should keep conditions inside your wine cabinet within the recommended storage range: between 55° and 60°F. All brands certainly claim that they'll do this, but CellarPro units can back that claim up with data. We recorded the performance of our 1800 cooling units, as well as the performance of competing brand Breezaire's cooling units, over several days and varying conditions. CellarPro cooling units successfully maintained cool, optimal wine storage temperatures in the tight range around 55°F. Your can compare the performance capabilities of each brand's units on these charts. For instance, even when the test room temperature stretched over 95°F, CellarPro's 1800XT (one of the cooling units you can choose for your wine cabinet) provided consistently desirable temperatures with no significant fluctuations. Simply by pressing a series of buttons on CellarPro cooling units' digital control panels, you can increase or decrease the amount of moisture that is recycled—which increases or decreases the humidity inside the wine cabinet. Maintaining a recommended wine storage humidity of around 60% is a key factor in protecting your wine collection. When humidity drops too low, wine corks dry out and shrink, allowing air into the bottle and potentially damaging the wine. If the humidity climbs too high, the dampness can make the cooling unit less effective and cultivate mold inside your cabinet. We tested how well CellarPro cooling units recirculate the right amounts of humidity within Le Cache cabinets. As the performance data shows, even while the outside humidity remained low at 35%, the CellarPro unit kept conditions inside the cabinet at the desired 60% humidity. Most brands of cooling units and wine coolers don't let you regulate humidity, only temperature. However, by purchasing a Le Cache cabinet, you can provide consistently optimal humidity conditions for your wine. 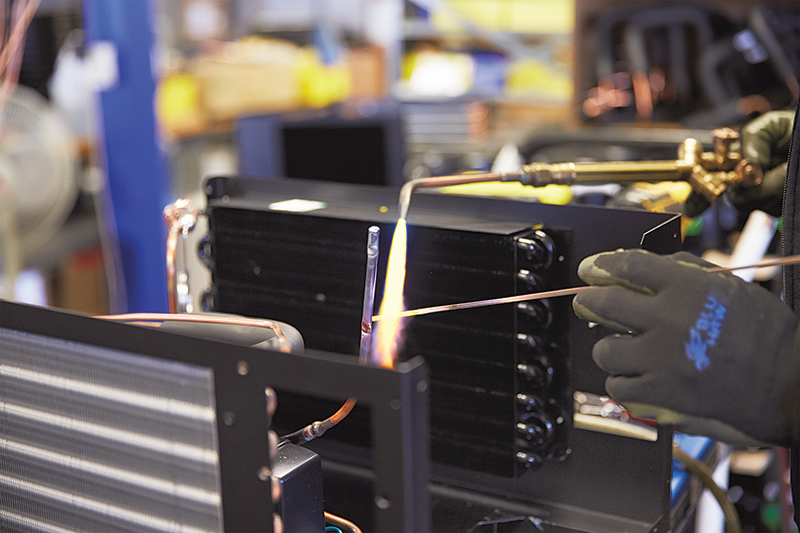 CellarPro's engineers develop the long-lasting cooling technology right here in the United States and execute designs using components from trusted American and European suppliers. We assemble all CellarPro cooling units at our state-of-the-art facility in the heart of wine country in Sonoma County, California. No unit leaves our base without being individually inspected, tested, and certified before it ships. Our units include fans designed to produce low noise emissions and high-output airflow. CellarPro sources fans manufactured especially to our exacting standards in order to keep the noise levels below 50 decibels—the equivalent of the faint hum made by most refrigerators, when installed in a wine cabinet. By generating high airflow across both coils, our cooling units maximize cooling capacity and reduce temperature stratification inside the cabinet, so that the difference in temperatures between the bottom, top, front, rear of the cabinet will be minimal. What makes a cooling system work smoothly, day in, day out, for years? The finest available components. Because we use only premium parts, we can provide the best cooling unit warranty in the industry: 5 years parts and labor warranty coverage. CellarPro units run on compressors from Danfoss, a global leader in refrigeration products based in Denmark. Inside each cooling unit, we use oversized compressors to achieve better performance and longevity. Quiet, vibration-free, and reliable, Danfoss compressors maintain desired temperatures without the drawbacks of lesser-quality, more disruptive compressors. We designed CellarPro units to include oversized evaporator and condenser coils for maximum cooling power. Condenser coils dissipate the heat generated by the refrigerant when compressed from gas into liquid. Evaporator coils remove heat when warm air comes into contact with the cold surface of the coils. Our evaporator coils are covered with a commercial-grade Electrofin coating, which protects the coils from leaks and corrosion. The coil is dipped, not spray-painted, for a more durable coating, and then baked to provide a chemical-resistant barrier against corrosion. This process prevents leaks and extends the cooling unit's lifespan. All CellarPro units feature detailed electronic thermostats and digital displays that are designed to show the temperature inside the cabinet at all times. Our control panels and electronic thermostats let you input and maintain temperatures inside your cabinet with digital precision. The cooling units also record high and low temperatures for future reference, so you can look up the maximum and minimum. If you'd like to measure and display liquid temperature instead of air temperature, we also separately sell a bottle probe that you can plug into the cooling unit and insert into a bottle placed inside your cabinet's racks.